Save money with our limited special Stevia sweetener tablet promotions! Stevia is a plant which is called Stevia rebaudiana, but also sweet herb or honey herb. The sweetener extracted from this plant is called steviol glycosides. The dry mass of the stevia leaves contains, depending on the variety of the plant approx. 10-15% of steviol glycosides, which is also known as stevioside. Furthermore, you find the in the leaves the valuable rebaudioside-A in a concentration of 4% to 9% and other steviol glycosides and rebaudiosides. The pure rebaudioside-A may have an sweetness of up to 450 times to sugar. The rebaudioside-A is the sweetest component of the stevia plant and the tabs contain 18% Rebaudioside-A. Because stevia has no calorific value, these are referred to food as "empty calories". Another advantage of Stevia is that it is not cariogenic and is thus not such as sugar promotes tooth decay. Since December 2011, steviol glycosides are now finally in the EU approved as a food additive and consumers now have an alternative sugar substitute. To ensure a healthy lifestyle, you can add the delicious sweetness for sweetening hot and cold beverages such as coffee, tea and iced tea lemonade but without all those calories. When you are on the move our handy little dispenser fits perfectly into your handbag or in your jacket. At home you can use our dispensers as well as a they are perfect for the coffee table or for the use in the office to sweeten your cold and hot drinks. 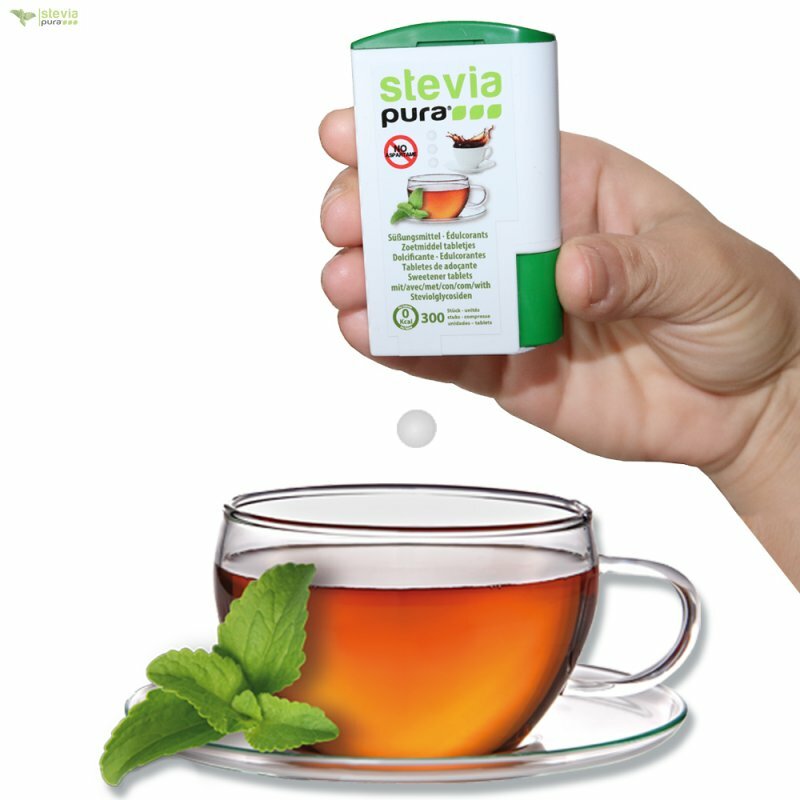 A Stevia tab / tablet is equivalent to about a sugar cube 4g. free of gluten, lactose, maltodextrin and flavorings. Premium quality at a reasonable prices.